DAP’s investigation examined the radiological preparedness in 22 jurisdictions within a 50-mile radius of the Fermi Plant. Only 19 of the 22 contacted jurisdictions provided responses. One jurisdiction within the 10-mile radius from the Fermi Plant reported providing educational materials or plans to residents regarding how to respond to a radiological incident at the plant. One out of the 21 jurisdictions within the 10-50 mile radius from the Fermi Plant reported providing similar educational materials and plans to residents. Only 8 out of the 22 jurisdictions provided all-hazard emergency plans and/or evacuation plans. Only one out of the 22 jurisdictions provided emergency plans specific to radiological incidents at the Fermi Plant. No jurisdiction furnished a shadow evacuation plan or study. Ben Smilowitz, the Executive Director at DAP, spoke with Michigan Radio about the report and its findings. 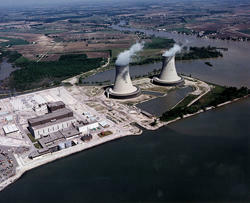 Monroe County, located in southeastern Michigan, is one of two counties within a 10-mile radius from the nuclear plant. The director of Emergency Management in Monroe County, Mark Hammond, spoke with Michigan Radio about the already in-place precautions taken by the county. "In Monroe County we have seven evacuation zones, sirens, and a system of shelters in place, and a practiced evacuation plan for the entire county," explained Hammond. In counties that are not within the 10-mile radius of Fermi, Hammond says there is a different kind of actual hazard following an explosion. "Because Monroe County is within the 10-mile radius, there is the need to worry about inhalation," Hammond said. "The people within a 10-mile radius of an explosion need to be very worried about inhalation while those at the 10-50 mile radius are more concerned with an ingestion hazard. While still concerning, an ingestion hazard isn't as worrying as the fear of inhalation following a plume. So the citizens of Monroe have more of a need to be very aware of the precautionary steps. The concern in other, farther away counties lies more in the state government or individual jurisdiction." DAP reported that a further study is necessary to determine the level of public knowledge and the likely public reaction to a nuclear plant emergency.